Fiona Peart is a full time professional artist, showing and selling her paintings at exhibitions in the UK and overseas. Her work can also be found in private collections around the world. Fiona also demonstrates her painting techniques at Art Shows, and for various art societies in the UK. She is also a teacher in a range of mediums, mainly watercolour and acrylics. Although she was born in the North East of England, she has moved the world as her Father was stationed abroad. Her childhood was mainly in Kenya and Rhodesia. Her first exhibition, at the young age of 12, was with the East African Wildlife Society. Her teenage years were shared between her Harrogate school and her home in Kenya. She attended art college in Newcastle when her family returned to the UK. 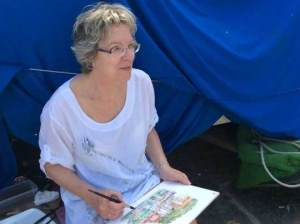 On the move again, this time to Oman for a couple of years, she set up her first painting group where she says, ” I began to realise how much I enjoyed sharing my passion for painting with others”. She then studied drawing and watercolours for 3 years full time at the Flemish academy of Fine Art in Leuven, Belgium, from where she successfully graduated and was awarded the ‘best achievement’ prize in 1990. Her first book, 30 Minute Watercolours, published by Harper Collins was a great success. It was swiftly followed by ‘How to paint Water Colour washes’ and ‘Watercolour Flowers’ was published by Search Press. Thereafter she has published three project books ‘Ready to Paint Vibrant Flowers’ ‘Charles Rennie Mackintosh Flowers’, and ‘Ready to Paint Tulips’ followed after which. Fiona’s latest book ‘Drawing and Painting with Water Soluble Media” was published in 2014. She has also produced various DVDs. View some of her work. Fiona is inspired by light and shadows. ‘I love painting in dramatic sunlight whether it be a busy street scene or a deserted beach….. I can be sitting drinking coffee in a café and watch how sunlight falls on the figures at a nearby table, or it could simply be a glimpse down a pathway to a view beyond. I particularly love the coast, the changing moods of the sea and the light on the water”. Fiona works incredibly hard helping others to learn the joy of painting and discover their own talents. She is warm and caring tutor.